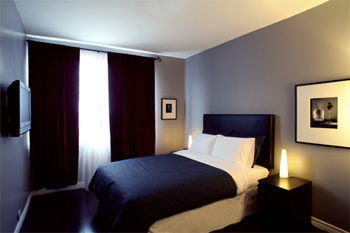 Bed and Breakfast, located at the West Queen West Art and Design district in Downtown Toronto. All our rooms are designed with urban living in mind, no clutter, not stuffy garage sale furniture! Each room has a private or ensuite bathroom, guests will never have to share with anyone else! Comfortable bed that ensures you have a good night sleep. FREE Wireless Internet access in each room. We are just a short walk to various art galleries, restaurants, bars, cafe, shops and much more. Neighbourhoods such as Liberty Village and Little Italy are close by. Eaton Centre and Queen West Fashion District are just a street car ride away. If you are here for trade shows, we are walking distance to the Direct Energy Centre/Exhibition Place. Very Convenient! 24 hrs Public transit almost right at door steps. Dufferin bus stop and Queen streetcar stop very close by. COME STAY WITH ART, A unique & memorable experience awaits you! INDEXG B&B 50 Gladstone Avenue Toronto, M6J 3K6, Ontario, Canada ©2008-2015 Ocean & Pounds. All Rights Reserved.